Some people predict the end of winter via a confused rodent’s shadow. I prefer the subtle vermiculations of the bronze bass–a smallmouth in hand is as sure a sign of spring as anything in the catalog. It’s true that the odd smallmouth bass is caught by walleye anglers very early and very late in the season when water temperature are in the upper 30s to low 40s. However, it’s typically not until water temperatures start creeping up toward 45 degrees that bass can be effectively presented to with a fly rod. 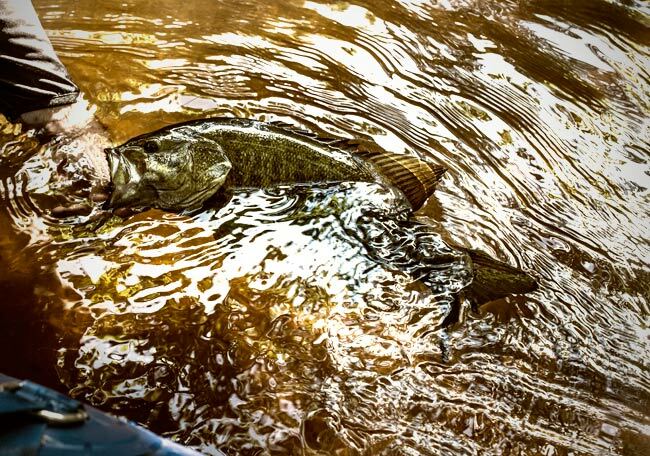 If you live in a state with a closed bass season, the activity of bass on the opener will vary by year: sometimes fish will be very active prior to the start of the season and you can hit the ground running. Other times, the season will begin with snow on the banks, cold temperatures and very lethargic fish. Whatever the case, it’s important to remember that our human concept of a fishing “season” doesn’t always correlate with a bass’s. A preternaturally warm week of weather in early March may make for good day of fishing far ahead of schedule. Like-wise, a patch of belated winter weather in May could put a serious damper on your first serious smallmouth outing of the year. In the early season, water temperature is far and away the most important factor for smallmouth success, and it can be worth thinking about how to put yourself on the warmest water possible. Begin by asking yourself this: what part of a given river system should I fish? Any trout angler knows that rivers typically gain temperature the further they get from their headwaters. Downstream stretches tend to be naturally warmer. The current is slower and the substrate is siltier, creating more particulate matter in the water to absorb the sun’s energy. But there are other factors to take into consideration as well. One is the presence and location of major ice buildup on your watershed. In the smallmouth bass’s northernmost range, ice can remain on backwaters, feeder lakes and dam impoundments well into the fishing season. Early season smallmouth anglers should stay away from heavy concentrations of ice which will leech cold water into the system even (and especially) on warmer days. Tributaries are another important factor in our hunt for the warmest possible early-season water. The temperatures of tributaries can vary a good deal, so make a point to learn how each inflow on your system compares to the temperature of the main brance. We recommend doing this twice a year, once in the early season and once again midsummer, since feeder creeks may not always provide a temperature advantage. That thermally regulated spring-fed feeder creek might be a fish magnet in the spring when the main river is just waking up, but if it stays temperate year-round, in July it might just become a too-cool smallmouth desert. Another thing to pay attention to is sunlight. At any given moment, one side of the river is receiving more sunlight than the other, and there will be a resulting bump in temperature there. For that reason, focus your attention on the sunny side of the bank, especially on larger rivers where working both sides of the boat might be difficult. The sunny side of the river will always be a degree or two warmer than the other side, and in the early season that single degree can make a huge difference on fish activity. The last temperature-related factor to take into consideration early and late in the year is time of day. Spring and fall are not the time to fish extra early or extra late in the day. On any given day a river’s temperature rises, but it’s during the early part of the season that a rise in temperatures can make or break a day. For that reason you should definitely prioritize the warmest part of the day—those hours between noon and 4 o clock. Spring fishing is often characterized by a flurry of fish activity during peak temps, so you definitely want to be in position to fish quality water when that bite window opens up. But what exactly is “quality early season water” anyways? There are two basic qualities that both need to be present in early season smallmouth water: depth and softness. Let’s start by talking about that softness. Slow current is where smallmouth bass can stage in preparation for spring without expending too much energy. We are basically looking for the softest water we can find that still has some proximity to the main flow of the river. Slow is good, but “not moving” is even better. Think coves, the slowest parts of larger eddy systems, pools behind larger deadfalls or wingdams, railroad trestles, bridge crossings and of course dams. But soft water alone does not make for good early season holding water. It also needs to be deep. How deep? That depends on your river. Early season water should be a good deal deeper than what is average for your river, and the best early season holding water will be a deeper hole on a beat of river with plenty of other deeper holes. On some watersheds, 4-5 feet may suffice. On others, fish will hold at 10-12 feet (once we get much deeper than 15 feet these fish become difficult if not impossible to apprehend with a fly rod). Once you find these early season fish, stop moving. Perhaps more so than anything else, when you find fish in the pre-season, stay on those fish. Where there’s one, there’s likely a lot more, and you may struggle to find fish later in the day.